Selecting the small pet that's right for your home is no small feat. With all the adorably tiny options, it can be difficult to determine whether your family's new addition should have fins or fur. After all, some pets need massive amounts of care and attention, while others prefer to be left alone. It all depends on how much time and effort you're willing to put forth to become a pet owner. You should also consider whether you'd like the type of pet you can curl up with on the couch or prefer to watch at a distance. A little snuggling might be possible with a chinchilla, but it's a sure bet your hermit crab won't take the bait. And, there are a few pets that aren't a good fit in households with preschoolers. So, where will you start? We've got the scoop on 10 popular small pets that, in one way or another, reward their owners with companionable ease. 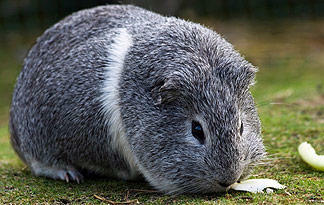 As small pets go, guinea pigs -- also known as cavies -- are virtual giants. In fact, each of the 13 guinea pig breeds recognized by the American Cavy Breeders Association can weigh up to 3 pounds or 1,360 grams (that's a lot compared to a parakeet). They come in several colors and patterns, and can have short or long hair. Housing and Exercise: Guinea pigs need lots of exercise. Pet retailers sell portable enclosures in which your guinea pig can safely explore an indoor or outdoor environment. You can add pipes for your pet to run through or offer hiding places like small boxes. However, resist the urge to add an exercise wheel to its cage. That's because running in a wheel could cause injuries to your guinea pig's back or legs. Good to know: Guinea pigs are actually from South America (not Guinea) and aren't pigs at all.